Position your dining room next to large windows to take advantage of lovely surrounding scenery. The Residence D - Avery 1 floor plan by Lennar in Foster City, CA. 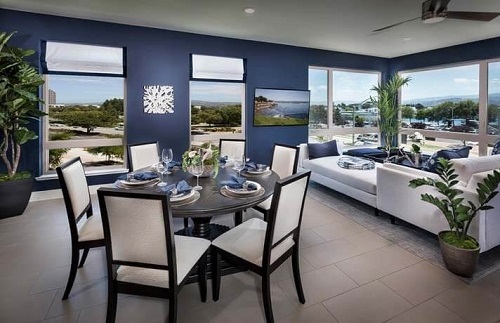 This dining area is perfect for entertaining with lots of room for friends and family along with spectacular views. The dining room is a shared space with both the kitchen and living room. Guests can mingle around the open area while the main dishes are being prepared. After everyone has finished their meals, comfortable seating is only a few feet away in the living room. To get the look: If your new dining room features a fabulous view, let it be the spotlight. Position the table so guests can enjoy looking outdoors. Keep the furnishings simple and use earthy, quiet tones to balance out the setup.